The war between Nazi Germany and Soviet Russia (1941–1945) was arguably the largest and most brutal theater of land warfare in the twentieth century. Fueled by bitter ideological antagonism, the enormous cruelty at the front extended directly into the treatment of prisoners of war on both sides. Of 5.7 million captured Red Army soldiers, about 3.3 million died in German captivity—a staggering mortality rate of 57 percent. By comparison, the mortality rate of British and American POWs in German hands lay between 3.5 and 5.1 percent. On the other side, almost one-third of up to 3 million German and Austrian prisoners of war perished in Soviet captivity. And Germany’s allies fared little better: 2 million of their soldiers, mainly Hungarians, Rumanians, Czechs, and Italians, were captured by the Red Army during the war and suffered mortality rates at times comparable to that among the Germans. In Soviet and German POW camps, years of hard labor and almost unbearable living conditions shaped the lives of those who were to survive. Facing this prospect, many soldiers on both sides decided to fight to the bitter end rather than to give up, thus intensifying and prolonging what already was a savage war. In the early morning hours of 22 June 1941, the German Wehrmacht (armed forces) and its allies invaded the Soviet Union. Taken by surprise, the Red Army initially offered only sporadic resistance. In the first week of July alone, the German army encircled and captured over 320,000 Russian troops at Biasystok and Minsk. Heading further east, it continued to capture huge numbers of Soviet soldiers, most notably at Smolensk, Kiev, and Bryansk. By the time the Wehrmacht’s advance came to its first significant standstill near Moscow in December 1941, over 3.2 million Soviet soldiers had fallen into German captivity. By February 1942, 2 million of them had lost their lives. This mass death had been clearly premeditated. Prior to the German attack, in March 1941, Hitler had relieved his troops from allegiance to the traditional code of military honor: “The Communist is from first to last no comrade. It is a war of extermination.” And despite occasional criticism out of its ranks, the Wehrmacht generally complied with the regime’s genocidal premises. Thus, for many Soviet soldiers, death came immediately after their capture: according to German orders, political officers (commissars) were to be shot on the spot and others, especially Jewish soldiers, were handed over to SS execution squads. Undernourished and liable to be shot if they were physically unable to carry on, tens of thousand then perished during the seemingly endless marches from the front to camps in Poland and Germany. Prisoners who made it to their permanent camp locations usually found nothing but a barren field surrounded by barbed-wire. For shelter, they were forced to dig holes into the ground. With no sanitary facilities, these “camps” soon became breeding grounds for typhus and dysentery. Then the coming of winter hit the inmates in their makeshift shelters. The most common cause of death among the POWs at that time, however, was starvation. In order to maintain the food supply of their own troops and that of the German civilian population, the leadership of the Third Reich had decided to induce a “natural” decimation of the Russian prisoners, whom they branded “subhumans” and “worthless eaters.” Some Soviet POWs even became the first victims of the gas chambers at a number of concentration camps, including Auschwitz. Clearly, the treatment of the Soviet POWs in 1941–1942 fell into line with Nazi designs of a racist war of conquest and annihilation in which no rules, be they legal or ethical, were recognized. In early 1942, however, pressure mounted to make use of prisoners of war in industry and agriculture. Following the anticipated victory, the German leadership had initially planned to demobilize large portions of the Wehrmacht in order to create a manpower pool for the defense industry. But with the advance stalled, demobilization became impossible. Instead, a first batch of 400,000 Soviet prisoners in Germany were forced to toil on projects such as highway construction and mining. Requiring a healthy workforce, the labor program led to the gradual betterment of the prisoners’ living conditions. In the spring of 1942, the death rate in the POW camps began to drop, though this was not entirely due to sudden German benevolence: by now, so many prisoners had died that in many cases the meager allotments of food became sufficient for those who remained. Yet, not until July 1944 did the food supply for the working Soviet prisoners reach a level comparable to that of other Allied prisoners in German captivity. To fall into enemy captivity on the eastern front turned out to be highly perilous for German soldiers as well. Here too, legal considerations made no impact. Even though the USSR had not signed the Geneva Convention, it had indicated that it would observe the Hague Order and the Second Geneva Convention for the protection of the wounded. Nevertheless, retreating Red Army forces more often than not executed their wounded POWs. But during the Wehrmacht’s initial advance in 1941 and 1942, the number of German soldiers in Soviet hands remained relatively low. Until the battle of Stalingrad, which ended in January 1943, the number of German POWs did not exceed 100,000. At Stalingrad, however, another 93,000 fell into Soviet captivity, of whom barely 6,000 were to survive their internment. The mortality rate among German POWs at the time rose to 90 percent, as the majority never made it to permanent prison camps. But unlike their Soviet counterparts in 1941–1942, the German prisoners were not subjected to a policy of systematic mass murder. Instead, they fell victim to the unorganized state of the Soviet POW camp system (GUPVI), to the chaotic conditions of a country ravaged by war, and to individual acts of retaliation. In addition, after months of winter fighting, many German soldiers went into captivity in pitiful physical state, at least one-third of them in need of medical attention, which the Russians generally failed to provide. Following the defeat at Kursk in the summer of 1943, the German army began its final retreat from Russia. The rising number of POWs now entirely overwhelmed Soviet capacities. The number of base camps in the Soviet Union tripled from 52 to 156 in 1944, yet scarcities remained everywhere, especially in food provision, winter clothing, and medical supplies. At the end of the war in May 1945, another 1.5 million Axis soldiers who had failed to reach American or British front lines flooded into Russian temporary POW camps. Once in camps in the Soviet Union, they were put to work to reconstruct the war-torn country. In fact, the USSR’s first five-year economic plan after the war depended heavily on POW labor. For many years and under often gruesome conditions, German and Austrian prisoners built power plants and railway tracks, the Metro in Moscow, defense industries in the Ural mountains, gold mines in eastern Siberia, and much more. Even the Russian atomic bomb program owed much to the labor and technical expertise of German prisoners of war. 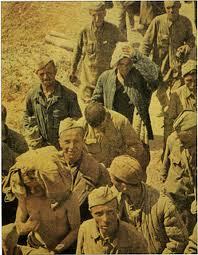 Given their suffering, the German prisoners showed little positive reaction to Soviet propaganda efforts. Attempts to organize them into an opposition to Hitler’s regime largely fell on deaf ears, even though small groups such as the National Committee for a Free Germany served as recruiting grounds for administrative personnel for the Soviet occupied zone of Germany after the war. The majority of the prisoners, however, experienced Soviet political influence as oppressive. Most infamous were the camp hierarchies established by the Antifa, groups of antifascist, mainly communist, German POWs who had been handpicked by Soviet authorities in order to control their fellow inmates. Usually, these selected prisoners occupied privileged positions in the camps and could be easily identified among their undernourished comrades by their healthy, well-fed appearance. The living conditions in Soviet captivity failed to improve after the war. Constant hunger, slave labor, and a lack of medical care led the prisoners to develop specific strategies of survival. The German prisoners adopted the “plenny-step,” a mode of slow movement designed to conserve the body’s energy that soon turned the camp inhabitants into a mass of bent, crawling figures. The “hunger winter” of 1946–1947, which followed a Russian crop failure, took yet another heavy toll on them. Soviet authorities had to declare a state of emergency for the entire GUPVI camp system in order to battle the dramatically decreasing labor output and the surging mortality rates. And given the importance of prisoner labor, repatriations began only gradually. In mid-1947, when the first mass repatriations of Austrian and Hungarian prisoners commenced, there were still over 1 million German POWs in the Soviet Union whose repatriation did not begin until a year later. By 1950, their number had slowly dropped to 30,000. The story of those last 30,000 German prisoners constitutes the final chapter of the sad history of POW internment on what had been the eastern front. Stripped of their status as prisoners of war and instead considered as convicted war criminals, these internees became a lever used by the Soviets in the Cold War, particularly with respect to the newly established Federal Republic of Germany. While some of these former German soldiers had undoubtedly committed war crimes, many others had received their original sentences—25 years of hard labor—for petty offenses or simply out of bad luck. For another five years, German prisoners toiled in the Soviet Union until that country finally repatriated them in 1955–1956 in exchange for the establishment of diplomatic relations with the Federal Republic. The last German POW did not return home until 1956, more than 10 years after the end of the war. Every so often a text appears which dispels the conventional wisdom of what we come to accept as history. Catherine Andreyev’s “Vlasov and the Russian Liberation Movement” is such a work. This narrative tells the story of one of the strangest, yet most compelling episodes in the history of the Second World War. In July of 1942, a Soviet Army general, Andrei Vlasov was captured by the invading German Army. He later came to lead a non-existent force known as the ROA, or Russian Liberation Army. Although this force had never existed, he was in fact the ideological leader of an estimated 800 million Russians who were opposed to Stalin and served in various capacities during the war. Throughout the war it was clear that the movement was not, as their opponents had charged, blind collaboration with the Nazi forces but a political movement in its own right. The goal of Vlasov and his group was none other than a free and democratic Russian state. In the course of the movement, it was in fact the Nazis themselves that provided the strongest opposition to the goals of the ROA. They, in fact had desired to use Vlasov only for the purpose of propaganda against the Soviets. Andreyev’s story tells the story of the various individuals in the movement and the tragic outcome of this movement. Particular emphasis is placed on different factions involved. In this story we learn about the soldiers themselves who were mostly Russian prisoners of war, as well as the civilian émigré groups who supported the ROA. We also see the internal struggle between the Vlasov’s group who sincerely wanted to liberate their homeland and the Nazi hierarchy who considered the Russians as being racially inferior and wanted to use them as puppets. In short this is an excellent story of an idealistic, but doomed group of people and their struggle. This book deals with the attempt by Soviet citizens to create an anti-Soviet Liberation Movement during the Second World War. The Movement’s ultimate importance lies in its expression of grass-roots opposition to the Soviet regime, the first substantial such efflorescence since 1922. The motivation of its titular leader, Vlasov, is examined in detail, as is its fundamental ideology, analyzed within the context not merely of wartime but of prewar Soviet and Russian emigré society. 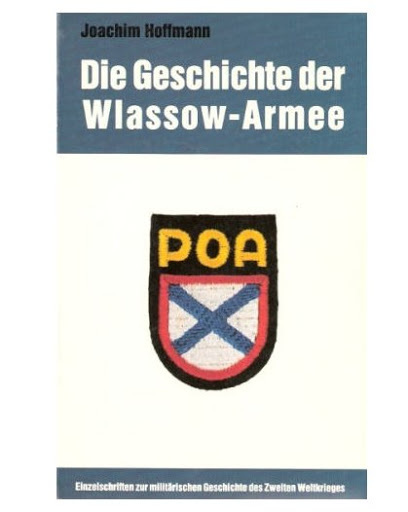 “Die geschichte der Wlassow-Armee” is best on the military history of the ROA. “It can be argued that it was Hitler’s idiotic policy towards Russia and Russians that lost him the war in the East, and, incidentally ensured the survival of the Stalinist regime. By the summer of 1944 when Himmler (of all people) sponsored a change of course it was already too late. In the event the German armies were overwhelmed, and the Russian Liberation Movement under General Vlasov became one of the might-have-beens of history. The Movement, however, has a significance of its own, apart from the moving human story of its leaders and its followers. Here we have an authentic account from the man best qualified to give it…”—–from the Foreword by David Footman. The author was on the staff of Field Marshall von Bock, commander of the Central Group of Armies in Hitler’s invasion of Russia. He kept a full diary from then till the end of the war, and it is on this that he has based this book. An account of the Russian Liberation Movement under the leadership of General Vlasov. The author was closely associated with Vlasov. Hitler failed to exploit the readiness to co-operate among the populations of Russia which greeted his troops when they first advanced into the Soviet Union. This one is good if you want to know the person Andrej Andrejevich Vlasov and his ideals. Fischer, George: Soviet opposition to Stalin. 1952. Dwinger, Edwin Erich: General Wlassow, eine tragödie .. 1951. Steenberg, Sven: General Wlassow, verräter oder patriot. 1968. English translation Vlasov, traitor or patriot. Strik-Strikfeldt, Wilfrid: Gegen Stalin und Hitler. 1970. 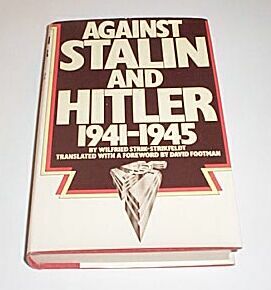 English translation Against Stalin and Hitler. The John Day Company. 1973. Thorwald, Jürgen: Die illusion: Rotarmisten in Hitler´s heere. 1974. Hoffmann, Joachim: Die Geschichte der Wlassow-Armee. 1984. 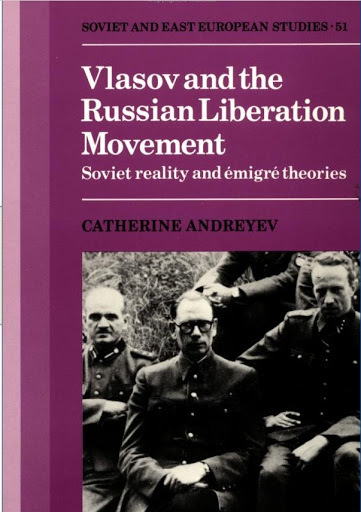 Andreyev, Catherine: Vlasvov and the Russian Liberation Movement. Cambridge University Press. 1987. Contains a list of literature, much in Russian. Drobjasko, S.: Russkaja osvoboditelnaja armija. 1998. Soldat series no. 5. Okorokov, A.V. : Materialy Po Istorii Russkogo Osvoboditel Nogo Dvizheniya, three parts 1997-99. Moscow. Tolstoy, Nicolay: Victims of Yalta. Hodder & Stoughton. 1977.